Aspen Romania, in partnership with the George Enescu Festival continues the 2015 Festival of Ideas with its main event on Wednesday, September 9, in a special Conversation with one of the most celebrated pianists of our time, Ms. Elisabeth Leonskaja. This event marks an important moment in her career, her life and the story of the Enescu Music Festival and Competition. 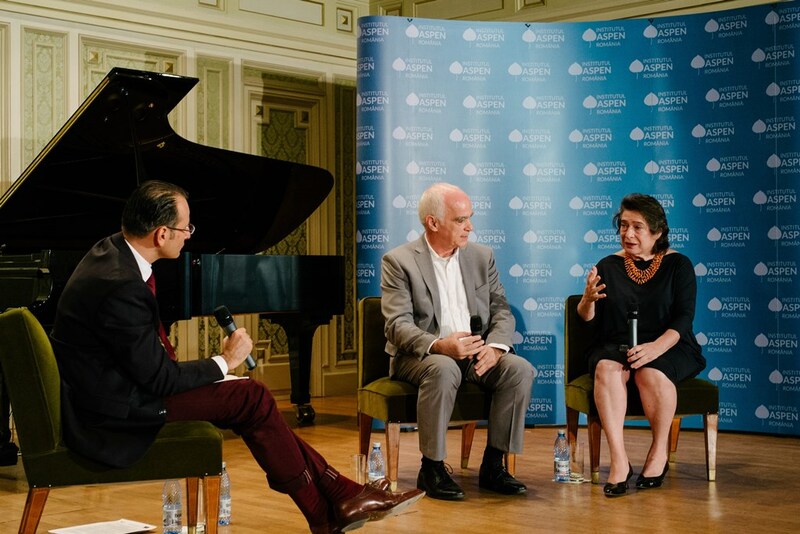 Fifty years after winning the Enescu Music Contest in Bucharest in 1964 – the event that in many ways propelled her on the major music scene – Elisabeth Leonskaja returns to Bucharest with ever constant generosity and emotion. We will be travelling through ideas and the lessons classical music offers to our society with the help of Ms. Leonskaja. The event is an opportunity for her many loyal friends and admirers to participate in a frank, open moderated conversation but also a tribute to her extraordinary attachment to the Romanian audience. Elisabeth Leonskaja was born in Tbilisi, Georgia, to a Russian family, and was regarded as a child prodigy, giving her first concerts as early as age 11. Her exceptional talent soon brought her to study at the Moscow Conservatory. While still a student at the Conservatory, she won prizes in the prestigious Enescu, Marguerite Long and Queen Elizabeth international piano competitions. Elisabeth Leonskaja has appeared as a soloist with virtually all the leading orchestras in the world, such as the New York Philharmonic, the Los Angeles Philharmonic Orchestra, the Cleveland Orchestra, the London Philharmonic Orchestra, the Royal Philharmonic Orchestra, the BBC Symphony Orchestr London, the Zurich Tonhalle Orchestra, the Berlin Philharmonic Orchestra, the Gewandhausorchester Leipzig, the radio orchestras of Hamburg, Cologne and Munich, the Czech Philharmonic Orchestra and many others, under the baton of such leading conductors as: Kurt Masur, Sir Colin Davis, Christoph Eschenbach, Christoph von Dohnanyi, Kurt Sanderling, Maris Jansons, Yuri Temirkanov and many others. A quote from the music magazine “Diapason” by Andre Boucourechliev (Paris): “Elisabeth Leonskaja’s journey leads from one pinnacle to another. By constantly excelling herself, driven by her own personal demands, by her passion and her intelligence she has scaled the heights achieved only by the greatest, not just of today, but of an entire epoch: those of a Clara Haskil, a Lipatti, and of modernity to boot”.